Internal linking is often overlooked during the search engine optimization arms race. Despite this, it is an easy way to help optimize your site. While not every website will see dramatic results from internal linking, others will be shocked to see forgotten about articles gain significant traffic, or see their pages ranking for new keywords. Internal linking is any link within your website that links to somewhere else on your website. Logically, these links fall into two basic camps: structural and contextual. 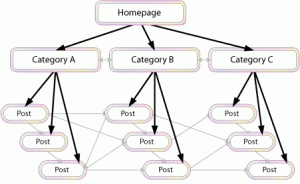 Structural links are generally created while designing the website. They include any navigation bars, site maps, footers, and headers. Without well planned structural links, it’s possible to have pages completely unattached to the rest of your website. In this scenario, the only way to access these pages would be to type in their URL. For this reason, structural links are designed to ensure no pages go missing. Unfortunately, many people see structural links as the be-all-end-all of internal linking. This isn’t true. Your website has a wealth of knowledge and countless opportunities to help boost its own search engine rank through contextual internal linking. The best way to begin a contextual link building campaign is to review your website and determine your goals. Do you have high-quality pages that are rarely viewed? Is an important aspect of your company getting drowned out by other pages and key phrases? Do you want an evenly distributed web of links that keep people on your site longer? These kinds of questions will help shape how you approach your campaign. The basis of contextual links is using key phrases from your content (otherwise known as anchor text) as your link. These key phrases infer the content of the page it links to. Search engines use this information to help rank pages for key phrases used in the anchor text. As such, anchor text should be keywords with high search volume and should be directly related to the page it links to. Once you understand the simple mechanics of contextual link building, the process of adding links to your website becomes intuitive. Page by page you need to go through your website adding links that will help you reach your goal. If you’re trying to boost the visibility of some overlooked pages, you might link to them from a high-traffic page. If you’d like to keep people clicking through your site, you might add links when new ideas are introduced. For a page of great importance, you may link several pages to it to increase visibility. If a page is ranking poorly for an important keyword, use that keyword as anchor text when linking to that page. As with everything in life, there can be too much of a good thing. Stuffing your website with links can negatively affect your search engine rank and will certainly annoy any users that visit your site. As a rule of thumb, only add links where they make sense and increase website usability. To some, this SEO technique seems too good to be true. While it won’t singlehandedly cause your website to rank on the first page, it is an effective tool in your SEO arsenal. The benefits range from small bumps in traffic to pages ranking highly for completely new key phrases. With search engine optimization being a constant arms race, taking advantage of every small step is vital to landing that coveted first page slot. Did you know about internal link building? Tell us your thoughts below.